I had the most amazing week, Thursday afternoon. My week was so busy, it went by in a blur. But one moment of time stood out. What was that ONE moment? For me… I had an important phone call to make….and I was dreading it. It was one of those times when I felt totally helpless, inadequate, and lost. The matter of concern had also been a matter of prayer…for some time. This day I needed to press the numbers on the keypad and connect with the unknown. I needed help. Moses answered the people, “Do not be afraid. Stand firm and you will see the deliverance the Lord will bring you today. The Egyptians you see today you will never see again. The Lord will fight for you; you need only to be still.” Exodus 14:13-14. You probably know the Bible story of Moses and the Israelites and their escape from Pharoah and the amazing miracle of the crossing through a parted Red Sea. Watch God fight for you and deliver you, today. Amazing. Their directive did not include weapons or armor or even creating some sort of protection from their enemy. Essentially…it was a do nothing plan. How many times are we in a difficult situation where there appears to be no way out or no answers and so we start flailing around doing all kinds of things to fix it. Doing. We are such doing people. It is so not us to do nothing. To be still and watch God fight for us. The result of my conversation? Amazing, ” immeasurably more than all we ask or imagine.” God gave me peace of mind, fought for me and provided a miraculous outcome. One moment. One day. Unforgettable. What is it that’s weighing on your mind? What burden do you carry that is unbearable? Circle this scripture in prayer: “Do not be afraid. Stand firm and you will see the deliverance the Lord will bring you today. …. 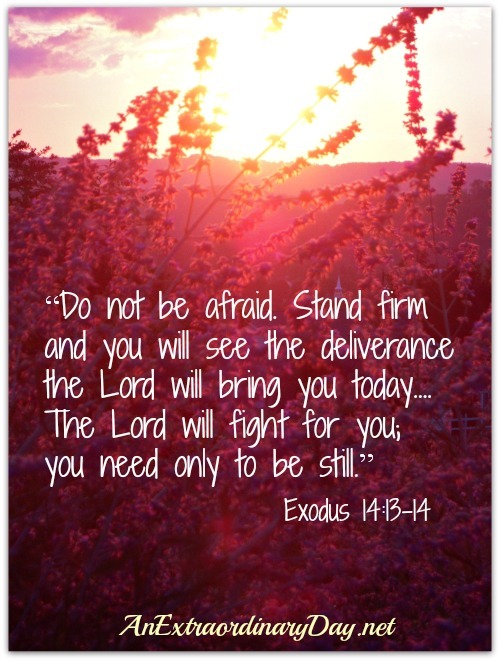 The Lord will fight for you; you need only to be still.” Exodus 14:13-14. Trust the God who created you to fight for you. He loves you. So much. And thank Him in advance for the amazing way He will answer your cry and fight for you. For more thoughtful devotional meditations and images on Exodus 14:13-14… Click below! It’s your turn! Would you join me in counting just seven? Let us rejoice together! Please leave your thoughts in the space below. This has been a favorite scripture of mine! He is so faithful to fight our battles. What a great testimony of how God fought for you and the miracle answer. Thanks for sharing. We have such a loving Father….what blessed people we are. Wishing you an Extraordinarily blessed week! What beautiful photos. And I love that we can take our anxious thoughts to the Lord in prayer. He is always faithful! Wishing you a blessed new week!! He really does make all things beautiful!